"The Licking County Court-house, an ancient and notable structure, located in the center of the public park, was totally consumed by fire at an early hour this morning. The light from the cupola of the doomed building was noticeable for a considerable distance, and the scene during the season of destruction was picturesque in the extreme. The origin of the fire remains a mystery. It was first discovered in the Auditor's office, where the flames spread with such rapidity as to baffle all efforts to extinguish them. The citizens are deserving of great praise for their agility in trying to save the records of the different departments and were in a great measure successful. The records in the Probate Judge's office, including personal papers of value and fac-similes in the Prosecuting Attorney's office, with the Public Library, were wholly consumed. The records in the Recorder's, Sheriff's, and Treasurer's offices were saved with but little damage, and also those in the Auditor's office, extending back to 1865. The building was insured for $10,000." FamilySearch's Wiki confirms that many records were lost, corroborating the article's initial assessment of the damage. In fact, Licking County's digitized probate records on FamilySearch (and now Ancestry.com) don't begin until 1875. Decades and generations of county and family history were torched during the devastating "season of destruction." Thomas Kirk, my fifth great-grandfather, lived and raised his children including Vachel Kirk, my fourth great-grandfather, in Licking County. Both Vachel and Thomas had untimely deaths. In either late 1831 or early 1832, Vachel died when he was about 27 years old. I have no records or family lore to explain his early passing. After Thomas' second wife passed away, her obituary casually mentioned that he was "accidentally killed" in December 1846. Excuse me, did you say accidentally killed? I've already been hard on the case trying to uncover Thomas' ancestral background. He represents my Kirk brick wall. I don't know who his parents were or where they came from. As if that mystery wasn't already eating at me, now I have this eyebrow-raising, tantalizing clue suggesting his death was an untimely accident coupled with his son's passing before the age of 30. What I wouldn't give to have some courthouse records right about now! While many records were destroyed in the fire, all sources concurred that some were salvaged. What light, if any, could the surviving records shine on my Kirk ancestors? I contacted the Records and Archives Department at the courthouse to see what documents survived from the 1830s and 1840s. The Court of Common Pleas, which handled Licking County's probate files before 1851, has a variety of materials - not indexed, not microfilmed, not digitized. They require someone to physically trawl through each file and docket. Fortunately, a Reference Archivist agreed to do just that! A genealogical angel! After a month of research, we had results! Several entries appeared in the Court of Common Pleas journals for both Vachel and Thomas Kirk. Like a phoenix from the ashes, my family history was rising. 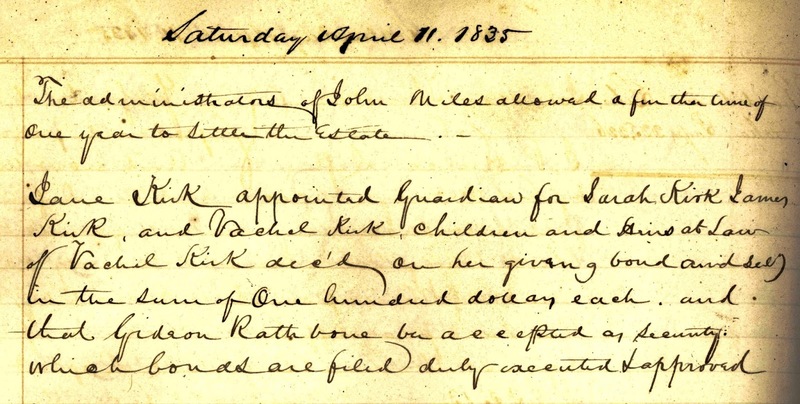 On March 31, 1832, the first document for Vachel's probate package appeared in court records. According to the record, it was "Ordered that Letters of Administration on the Estate of Vachel Kirk deceased be granted to Jane Kirk (widow) and Gideon Rathbone and that they give bond and security in the sum of five hundred dollars. Thomas Kirk and John Colier security accepted by the Court. Anthony Pilzer, John [illegible] & John Parks appointed appraisers on said Estate. Bond filed & admin sworn in open court." Another brief journal appearance for Vachel a year later in 1833: "Administrator of Vatchel [sic.] Kirk deceased allowed a further time of one year to settle up the accounts of said Estate." The final journal entry was dated April 11, 1835 - three years after letters of administration were first assigned to settle Vachel's estate. 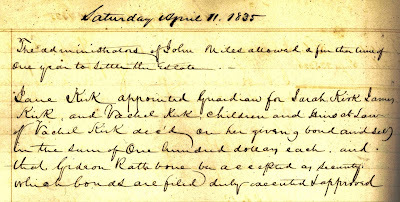 The record stated: "Jane Kirk appointed guardian for Sarah Kirk, James Kirk, and Vachel Kirk, children and heirs at law of Vachel Kirk deceased on her giving bond and security in the sum of one hundred dollars each and that Gideon Rathbone be accepted as security which bonds are filed duly executed and approved." This document is fantastic. It's genealogy gold. It provides the names of Vachel and Jane's children. A month ago, I had no idea the name of their daughter. Of course, just four short weeks ago, I uncovered her name the hard way using land records among other sources (see Land Records Reveal Family and Sizable Estate). Where was this journal entry when I wanted the easy way out?! I'm struck by the fact that Jane Kirk was appointed legal guardian for her children. Early 19th century common law removed that right, among others, from married women until they were widows. According to Bob's Genealogy Filing Cabinet, "Widows regained the rights of unmarried women during the period of their widowhood. A widow could make a will, buy or sell property, act as a guardian, sue or be sued, or be an executrix or administratrix." Isn't it odd how legally empowering the death of a husband was for a woman? Only one record has been found for Thomas Kirk to-date. From an 1847 session of the Court of Common Pleas, a journal entry appoints letters of administration to settle his estate. The record stated: "Thomas Kirk, late of Licking County, deceased, having died intestate, and his widow, Anna Kirk, having relinquished her right to administer in favor of James Kirk, it is on motion ordered that letters of administration issue to the said James Kirk, who accepted said trust, and gave bond conditioned according to law, in the final sum of $400, with Thomas Kirk [Jr.] and Daniel Kirk, as securities; which bond is approved by the Court. Ordered that James Johnston, George Aubert and Hugh Ford appraise the personal estate of said intestate." On first review, without any further research, this entry tells me that Thomas died without a will, and that his son James was appointed estate administrator. What is the relationship of the other people named in the record to Thomas? I need to investigate these relationships in case there are any clues to my brick wall questions. While the Archivist has several other sources he plans to investigate, these initial documents have not provided answers to the fundamental question of how these two men died. Nor have they answered who Thomas' parents were. That's okay. I wasn't expecting to find the smoking gun. With few records on Thomas and Vachel Kirk in existence, I'm absolutely thrilled that anything survived the 1875 courthouse blaze. Let that be a lesson to you to connect with multiple offices of the courthouse to make sure records haven't been overlooked or stored elsewhere. You never know what's been tucked away for safekeeping and, eventually, forgotten. Now, how do I prompt FamilySearch to send out a team to photograph and digitize all of these records? Your family was patiently waiting there for you to discover them in those hidden records. Congratulations and hope your genea-angel finds even more for you. Exactly! And it makes me wonder what other goodies are waiting to be found. Fingers crossed that my genea-angel has more success. Volumes of Court of Common Pleas estate partition records survive, uploaded at FamilySearch. There are indexes at the beginning of most of the volumes, and the Licking County Archives has a 2-volume every-name index to these records. There are also interesting records to be found in the volumes of Mortgages. Thanks for the tips, Geolover! I've been through the partition records without any luck. However, I understand that even the existing indexes with those records are not entirely complete or comprehensive. It's helpful to know that the Licking County Archives has a 2-volume every-name index to those records. I'll follow up to confirm whether any Kirks make an appearance. Do you know where the volumes of mortgages are held? How far back do they go?